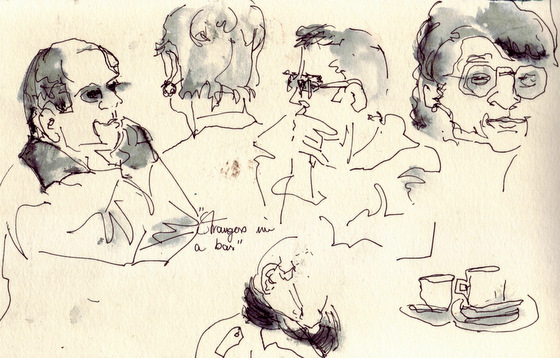 A few sketches of December…a leisurely walk by the Loire, some faces in a bar and a shed in a friends garden. ..sketchbook 15,3×25 cm, watercolor and pen..
..sketchbook 15.3 x25cm, watercolor and rotring pen..
Vraiment.. pleine de talent! 3 different feelings.. You are so great at faces too! Wonderful vernissage for us..Did you give M-C her little shed watercolor? Beautiful winter moments, Ronell. I especially like the one of the shed, and your faces at the bar have so much character to them–great fun to see because I love to watch people in places like that. So beautiful, Ronell. I love your sketches because they’re so relaxed and joyful. You have a way with line and color that I admire. Love the sketches of the faces in the bar…unique! 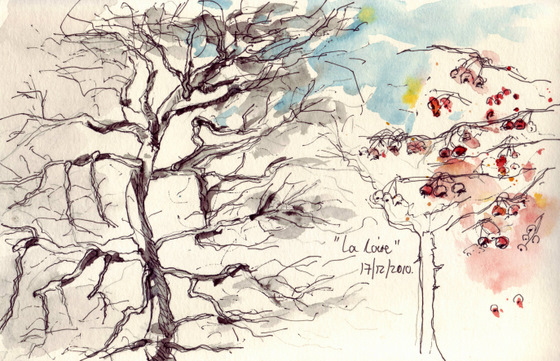 Truly feels like December in these sketches — very nice!! 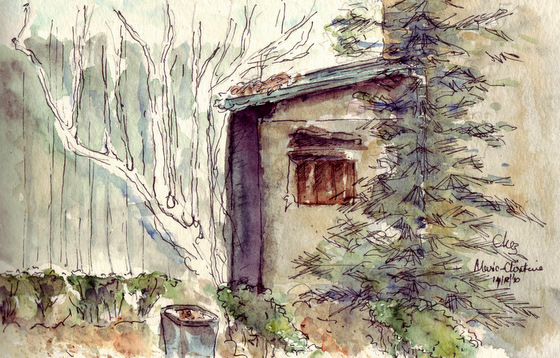 Great sketches…especially the shed!!! Hope the recent snows haven’t affected you too much. Have a wonderful Christmas and New Year!